I’m supposed to talk about the revolution created by DSM-III, but obviously to this audience, I do not have to discuss its innovations: advisory committees to the Task Force, field-testing drafts, multiaxial diagnostic system, diagnostic criteria, systematic description of all disorders listed, glossary of terms, to name a few. Since I am a historian, what I will do instead is put Bob’s contribution to psychiatry in an historical perspective. To do so, I am going to talk about two time periods in the history of psychiatry when it seemed vital that something be done to check a state of chaos. In so doing, I am going to compare Bob’s contribution to psychiatry with that of the great German psychiatrist, Emil Kraepelin, because I regard them as having equal significance in terms of their ultimate impact. In each instance, they introduced a new categorization to rescue a flailing field and established a momentum that has never disappeared. In the 1880s, German psychiatry–still a fairly new subspecialty of medicine–was in a state of crisis. Psychiatrists were confronted with a mass of symptoms and found it difficult if not impossible to distinguish between symptoms and illnesses; an individual symptom might be labeled an illness. Writing a new classification to remedy this impasse became a German national psychiatric pastime, but in each individual case the nosology basically stayed with its creator. Communication among psychiatrists was abysmal. Moreover, usually psychiatrists could not offer a prognosis to their patients or their families. Even though the state of organizational progress of this new specialty in the 19th century had been nothing short of miraculous, a sense of pessimism and gloom hung over psychiatry. 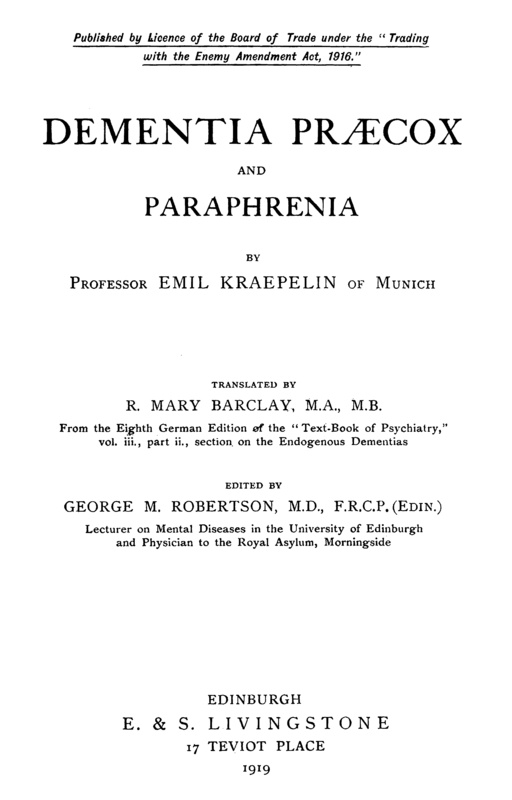 Kraepelin, a neophyte psychiatrist in 1883—just 27 years old—found himself short of funds and took the advice of a mentor, the famous experimental psychologist Wilhelm Wundt, to write a short compendium of psychiatry as a way to get some money. Kraepelin was amazed at the mess he saw and struggled to make some coherent sense of it. If I can crack a small joke: Kraepelin’s inter-rater reliability problem in 1883 was a lot worse than Bob’s in 1973. Kraepelin began to enlarge his compendium at regular intervals and eventually it turned into his famous four volume textbook. Somewhere in the middle of his updates, he put forth the idea that psychotic illnesses might be divided into two large categories—dementia praecox and manic-depressive illness–based on their typical course. He would have liked to develop a classification according to etiology but could not, although he speculated that mental disorders could arise from some faulty metabolism in the brain or from hereditary degeneracy. After initial resistance, Kraepelin’s nosology was accepted by many, and he was able to found a research institute in Germany, with money from the Rockefellers no less, to investigate the causes of mental illness. Gradually, over the years the notion spread that perhaps progress might come from describing mental disorders precisely and gathering facts about them, just as Kraepelin had successfully done in his textbook. I wish I had the time to quote for you one of Kraepelin’s compelling descriptions so you can see the precision and power of his words. However, the descriptive, phenomenological approach in the United States was retarded for a number of years by the dominance of psychoanalysis. Psychoanalysis, I might interject, just like Kraepelin’s classification, had been one answer to the state of stagnation and hopelessness of 19th century psychiatry. Still, even at the zenith of psychoanalytic dominance, the justly named neo-Kraepelinians in St. Louis in the 1950s and ‘60s—Eli Robins, Samuel Guze, and George Winokur–were not deterred from the research that was establishing a descriptive foundation. Yet the neo-Kraepelinians by themselves would not have been able to engineer a shift in American psychiatry. For that, DSM-III was needed. Moreover, the neo-Kraepelinians by 1970 were one small island surrounded by a chaotic ocean. In 1970, American psychiatry, much like the psychiatry Kraepelin had faced in 1890, was in a state of crisis. Let me specify what I mean. In the civil rights and Vietnam War era, psychiatry looked like it had lost its bearings. Some psychiatrists were thinking that the only way to solve psychiatric problems was to fight them on a social level by attacking poverty, unemployment, slums, racial prejudice head on. Others bent their energies to battle against issues like school segregation and the war on psychiatric grounds. Tens of thousands of discharged state hospital patients flooded the streets because certain federally-mandated care had failed to materialize, and it was clear psychoanalysis could not address this problem. Many studies had shown there was very poor inter-rater reliability in delivering the same diagnosis for the same patient, and psychiatry was held in low esteem by various scientific and medical bodies. Even a presidential commission and a congressional panel expressed concerns about how mental illness was documented. Aetna limited mental health coverage. In the decade 1963-1972, the NIMH cut back on research grants. In this climate, negative opinions about psychiatry were unleashed throughout various disciplines and social groups. Some of us forget just how widespread was the so-called anti-psychiatry movement of the 1960s and ‘70s. Of course, we cannot overlook the fact that by the 1950s state hospitals did warehouse hundreds of thousands who often received reprehensible care. But the anti-psychiatry movement went beyond calling attention to this and cut a wide and deep swath challenging the very legitimacy of psychiatry. Sociologists argued that mental disorder was merely in the eye of the beholder, that psychiatric diagnoses were just labels pasted on quirky or unpopular behavior, and that all inpatients had been illegitimately railroaded into custody. State legislators, always eager to spend less money on mental hospitals, readily adopted the arguments of the sociologists in order to justify their deinstitutionalization proceedings. Lawyers fought against involuntary hospitalization on the grounds of protecting civil liberties, and courts overruled psychiatrists’ expert advice. Thomas Szasz, a libertarian psychiatrist and psychoanalyst, inveighed against psychiatry as a “pseudo-medical enterprise,” and argued that psychotherapy—the dominant form of treatment in the 1960s—was solely a humanistic and philosophical endeavor. His provocative Myth of Mental Illness was later joined by the sensational Death of Psychiatry of E. Fuller Torrey. Torrey, while inveighing against psychoanalysis, asserted that schizophrenia, as a biological phenomenon, could be treated by medication which internists would prescribe, doing away with the need for psychiatrists. Further delegitimizing psychiatry, R.D. Laing, a Scottish psychoanalyst, came to preach that schizophrenia was not an illness at all, but a life-affirming journey that would lead the afflicted individual to greater heights. He became a guru to thousands of college students. In academia, the deconstructionists declared that there were no objective scientific truths. Truth was socially constructed, and knowledge varied according to the goals of its creator. The Scientologists, always ready to grab an opportunity, flew an airplane banner with the words “Psychiatry Kills” at the 1969 APA meeting. I cannot close this litany without mentioning the damaging impact of the 1973 Science article by David Rosenhan which put psychiatry on the defensive with its account of “pseudopatients” in psychiatric hospitals, or the much-mocked 1974 APA membership voting to remove the diagnosis of homosexuality from DSM-II. Under the circumstances I have just outlined, the APA Board of Trustees and Bob, independently, came to hope that DSM-III could be used to counter the notion that psychiatry was not a medical discipline and lacked scientific credibility. 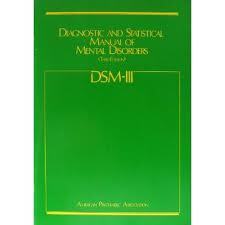 But it was not mainly DSM-III that repelled the anti-psychiatry movement. Rather the anti-Establishment mood of the country was combated more by the end to the Vietnam War and the coming of the Reagan era presidency. The broad separation of schizophrenia from manic-depressive illness and DSM-III, while great steps forward, did not solve all of psychiatry’s problems and even created new challenges. But this was a good thing because it began a profession-wide debate on the role and goals of psychiatry which continues up to the present. As the makers of DSM-5 wrestle with the revision of the manual, they are always testing their conceptions against those of DSM-III. In history, revolutions are made when a state of crisis and an unusually talented leader come together to effect change. A good example of this occurred in the 16th century, when a crisis in the Roman Catholic Church was taken in hand by an ardently devoted and charismatic monk and theologian, Martin Luther. The Protestant Revolution resulted. Such revolutions happened in psychiatry in the cases of the historic division of psychosis and in the creation of DSM-III, and we can see that these creations have their authors’ unique stamp. Last summer I spent eleven days in the APA Archives, and I saw endless demonstration of Bob’s enormous energy, creativity, and the extraordinary ability to solve problems and not be derailed by opposition. I’d like to close with an observation: Before DSM-III the DSMs only mattered to a very select audience, now the DSMs matter a lot to many. Because the DSM is powerful enough to shape our culture and society, American psychiatry now has the great burden of dealing with the wide influence it wields outside strictly medical confines. This circumstance began in 1980 with the creation of DSM-III under Bob Spitzer. Uh! Sounds weird. Almost fanatical.